House of Cards has had a good run, and we reckon that if the allegations against Kevin Spacey didn’t rise to the surface, it would have gone on for a few more seasons. Nonetheless, we arrived at the final stop, but the creators of House of Cards decided that this final season would run without its original main character, Francis Underwood, which was played by Kevin Spacey. 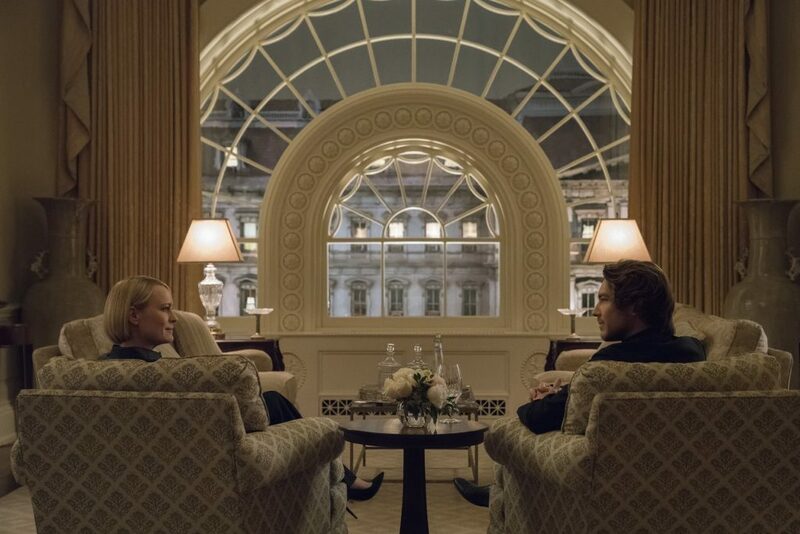 This time we see Robin Wright at the helm and while we weren’t sure what to expect, we were once again driven to the edge of our seats thanks to this political game of thrones. Beware, there are many skeletons left in the closet in this final season. With Francis Underwood (Kevin Spacey) out of the picture and buried six feet under, Claire Underwood (Robin Wright) is now the president of the United States of America. She has passed her first hundred days without too much turmoil, with Mark Usher (Campbell Scott) as her VP. Things are getting more serious though, as those who made deals with Francis still expect Claire to honor them, even if she had nothing to do with them. Claire wants to start off with a clean slate, and bury Francis’ sins with him. Sadly, due to this, she makes enemies with the Shepherd family, who have a great deal of influence, not only in the business world, but also on those in seats of power. Meanwhile Doug Stamper (Michael Kelly), Francis’ loyal soldier, implicated himself by confessing certain crimes, in order to lead away the attention from the former president. Now that Francis is dead, it seems that he is having second thoughts, and that he also wants to take it out on Claire, while at the same time still adhering to an odd alliance with her. The love-hate relationship will certainly cause a lot of tensions in these last few episodes. For the past five seasons, the series was actually a bit heavier than it is now. During the last few seasons it was Francis scheming, as well as Claire, making it rather heavy what to expect next. Now it’s just Claire scheming, and her opponents to a certain degree. While Claire is advocating for a better administration, she is in fact even worse than Francis when it’s all about taking down the opposition. At first you might somewhat agree with what she is doing, before she does a full 180 and shows you what kind of person she truly is. Nonetheless, the flow of the series remains pretty much the same, where one long ‘game of thrones’ is being played throughout the entire season. This time the new opponents are the Shepherd family and it’s all about rendering them useless, clearing the way forward for Claire. 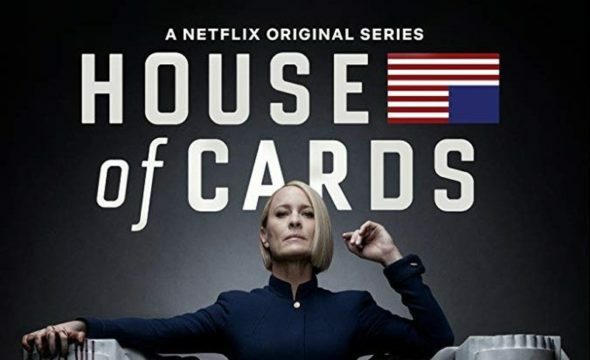 The series looks a lot different without the presence of Kevin Spacey, but Robin Wright does a great job in now breaking the fourth wall like Spacey originally did. It’s clear that it’s her turn now, and she gives us a formidable performance. Other, older cast members reappear such as Michael Kelly, who plays the dubious Doug Stamper and Derek Cecil who plays Seth Grayson. Jayne Atkinson’s time is somewhat reduced to a few shorter snippets as Catherine Durant. 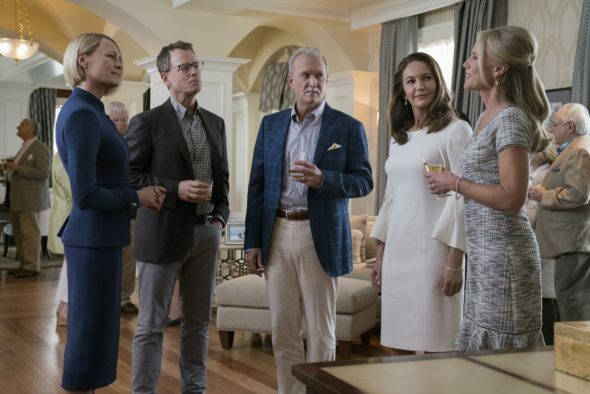 This season introduces Diane Lane as Annette Shepherd, Greg Kinnaer as Bill Shepherd and Cody Fern as Duncan Shepherd, who will be the opposition this season. 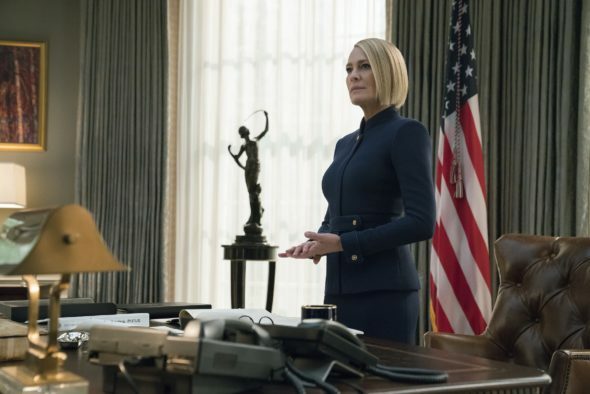 These three cast members play a believable foe for Underwood’s presidency and they make sure this season feels as impressive as the previous five seasons of the show. Campbell Scott was already a regular since the previous season, and he now picks up the role as the VP, who is under the control of the Shepherds. Sadly once again there are no extras to be found on the Blu-ray edition of the sixth and final season of House of Cards. While many portions of the series speak for themselves, some cast commentaries, a short making of or some other special features could have been a bit of extra value for your money when considering to purchase a physical edition of the series. The latter is even more true when keeping in mind that the full series is available on Netflix, and seeing many people have a subscription on said service, it doesn’t add a lot of incentive to buy a physical copy of the series. That being said, the series stands tall on its own without extra material, but it all ends up feeling like a missed opportunity. The sixth and final season of House of Cards does the series justice with a proper ending. While the presence of Kevin Spacey was missed, when keeping his dubious reputation for what it is, Robin Wright properly brought this series to its grand finale. Even though the sixth season is still without any extras on the physical edition, we are impressed with the way the story went, and that Wright is now the character that breaks the fourth wall. Overall, as far as endings go for a series, this one was quite impressive.